Cuff commission, originally uploaded by gilfling. I would be a full time leather crafter. Oh yes. I know it is not for everyone. I myself was vegetarian for 11 years from mid teens to twenties and would quite possibly have been horrified at the the thought. But ever since I decided in the final year of my Performance Costume Degree to make a costume with leather armour as the feature (never having worked with leather in my life before) I was transfixed by this craft. Anyhow, once the decision to make this leather armour was fixed in my mind, I of course sought advice and tutoring from my dad. Two minutes was what I got!! Ok possibly a little more - a little encouragement and the advice to just go with it and it would come with practice. So I just had to delve in and the images here and here were the result. I was proud of them and just loved every part of making that costume. It may not have seemed like it at the time due to the stresses of the course and my awful lack of time management but love it I did. I even thought for a while after graduating that I would really try and develop my work to feature leatherwork quite prominently, hoping to work on re-enactment costumes or costumes for films (big dreams of landing a historical medieval or fantasy films etc). I attended a few workshops on leather-work and have completed a few commission such as here and here. However life sometimes leads you in an unexpected direction and unfortunately I just cannot commit the time and dedication it needs to become a master leather-craftsmen. 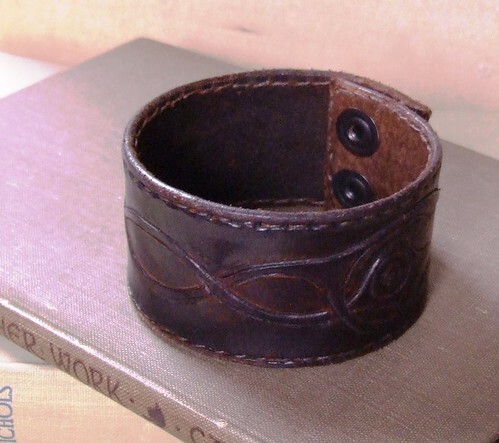 However I can still dream and do the odd commission as it comes up as this one did - a leather cuff with a hand crafted design - a present for a surfer/lover of the outdoors featuring his own design. A pleasure to work on and I like the result. There is something satisfying about working with leather. No fancy machinery or electric tools - all carved with very basic, even primitive tools, completely handstitched, the feel of the material, the staining of the fingers when hand-dying (stains that remain on my own skin for 4-5 days after finishing), the comforting smell of the leather and the dye. Such a tactile craft and one that has been practiced in some form or another for almost as long as we have roamed the earth. In another life I would be a master leather crafts-person. A beautiful cuff, I'm sure it will be treasured. That is lovely. And I thinks it's good to work in another medium every now and then.